Did you know that Restaurant BOWA is one of the best-rated TripAdvisor restaurants in Dubrovnik area? With 88 procent of excellent feedback, the highest ‘score’ that can make costumers of worldwide most popular touristic platform TripAdvisor, Restaurant BOWA once again proved its quality. 88 procent and highest evaluation of 5.0 really are the numbers which says more than any other proof, not just for food and manu quality, but complete experience that offers our authentic place – Restaurant BOWA. And yes, we are very proud for representing one of the best restaurants in whole Dubrovnik area, since this unique place isn’t actually located in town. For visiting our Restaurant BOWA, first you have to come to Elafiti islands, more precisely, the Sipan island, where everyone will gladly reveal that secret bay where will be waiting. 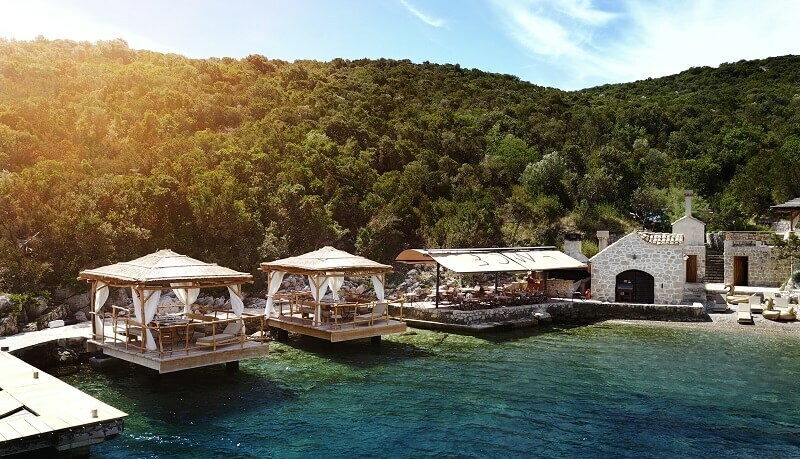 Hidden in untouched nature, surrounded with perfect visure and sounds and crystal blue sea Restaurant BOWA really looks like a place from fantasy, and that description, which we are very proud of, can also be refered on our complete gastro offer. With fresh ingredients, daily seafood catch and old, traditional recipes, our story really sounds like a fantasy. With one big distinction. Restaurant BOWA doesn’t offer fantasy, but truly magical experience, exactly what the users of Trip Advisor has already said. If you are visiting Dubrovnik and don’t visit Bowa then you have made a terrible mistake! We spent a wonderful day here last week (late september). We arranged our entire day directly with Bowa – transfer from our hotel and then boat to the island – and all went smoothly. We were picked up at 10.45am by a friendly mini-bus driver, and then it was around a half an hour journey to a pretty little harbour where our boat was waiting. There were around 6 of us getting on the boat, which took about 10 minutes or so to get to Bowa. As soon as you arrive you are blown away. The scenery is stunning, waters clear, staff friendly and the whole place just has a really nice, elegant atmosphere. We were shown to our cabana that we had booked, and then ordered some gin and tonics. We sunbathed for about an hour or so before we went back up to the cabana for our first 3 courses (we were on the tasting menu). First up was some kind of prosciutto style ham with a hard cheese, some toasted bread and olives. Then a very fresh tuna tartar, then scallop and fennel. All excellent. We then had a break of around another hour for sunbathing. Next up was a monkfish and langoustine dish in a kind of bisque, a lovely piece of swordfish with a gorgeous little mozzarella and spinach pastry, and then lamb and potatoes. Again, all very good but the best for me was the swordfish. We then had another half an hour or so in the sun, before coming up for dessert which was a kind of lemon mousse. Lovely. We had a couple of bottles of nice croatian rose, and the men of the group also polished off a few mojitos! After dessert it was sadly time to leave. The boat came again around 5.30 and we couldn’t believe how quickly the day had gone. Best day of my holiday. No other words to describe but amazing. Amazing location, amazing design, amazing food, amazing staff. Can’t wait to visit the place again. A friend stumbled across this unbelievable paradise location. While visiting Dubrovnik it was on our list to visit Bowa and it was something that was well worth the wait. The staff greeted us at the boat dock and got us situated in our cabana, that seated 10 comfortably. The food was absolutely sublime and the menu catered for all tastes. The wine menu and cocktails were very reasonably priced and varied. A must visit if an opportunity to spend the day in paradise presents itself . Fantastic way to spend an afternoon. Located close to Dubrovnik, quick boat ride away to a world away from the rest. The food and wine – simple but delicious – and then followed by a lazy float in the sea. Perfect!